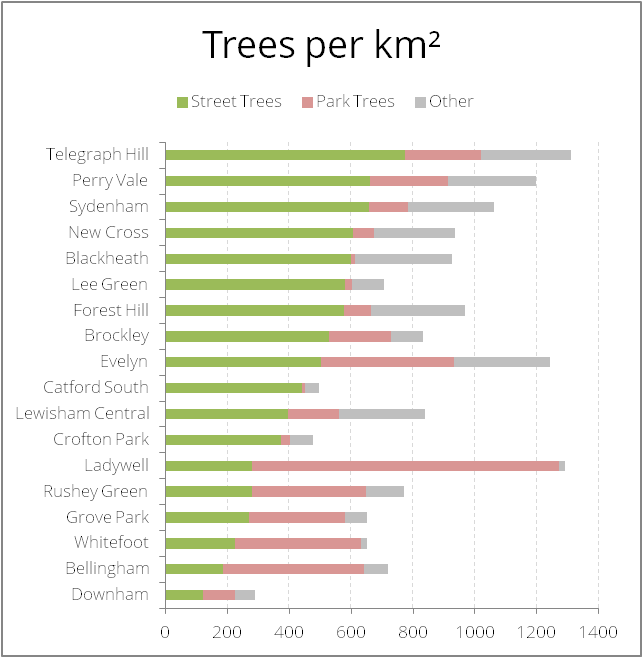 As mentioned on Twitter last week, I have discovered some tree data from Lewisham Council so I have been busy trying to map this (not without its challenges as there are ~30,000 data point included in the files). The map so far is below (styled in the same way as the original map). (Click on the arrows in the top-left to view fullscreen, click on the trees to view information on species, age, condition etc.). More to follow this weekend – watch this space! First of all, an introduction; my name is Harry and my girlfriend and I have recently bought a lovely house in Catford, just off Rushey Green. Hence the inspiration to begin a campaign to increase the number of street trees here in SE6. I know that council budgets are stretched at the moment therefore I intend to raise funds via donations from local residents and businesses and I will also be applying for any grant funding that is available. Please see the Campaign Plan for further details. The first stage in the campaign will be to raise awareness and engage with as many Catford residents as possible – therefore if you live in Catford and would like to see more trees on your street please leave a comment on our Comments page or Tweet us @se6_trees. I will be updating this blog with my progress over the coming weeks and months so please do check back for updates.